So, you want that big screen video projection home theater experience, but you don't want the hassle, or the room, for a full home theater surround sound audio system that requires all those speakers. Well, there is a solution that is easy to set up, use and doesn't take up a lot of space. That solution — Use an Under-TV (sound base) audio system. This type of system is similar to a soundbar, but instead of being mounted above or below a TV, it is normally placed under a TV. Depending on the brand, you will see these products labeled as a Sound Base, Speaker Base, Sound Plate, Wave Base, Sound Stand, etc. However, although they are designed and marketed to be used with TVs, you can also use these systems to get better sound for your video projector, in lieu of a full surround sound speaker setup. The way this works is that instead of setting a TV on top of the under-TV Audio System, set your video projector on top of it instead. 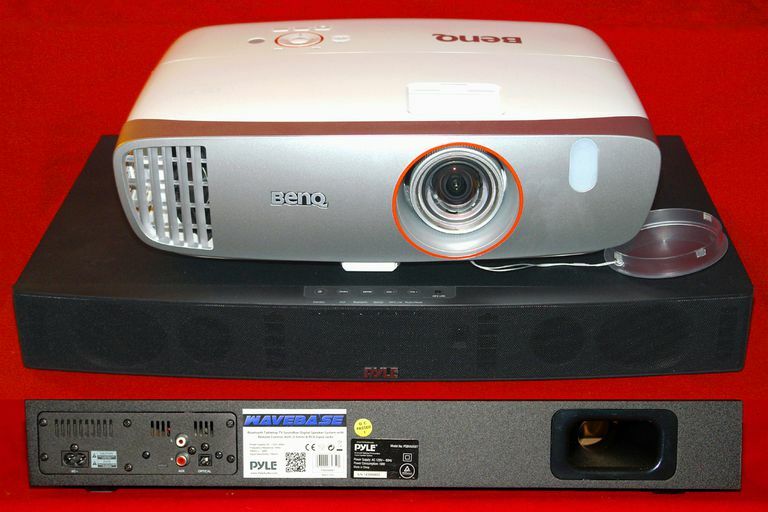 You need a video projector, an audio/video source device(s), such as Blu-ray or DVD player, Cable/satellite box, or Media streamer that has video outputs, such as HDMI, component, or composite, and both digital optical and analog stereo audio outputs. Then, of course, you need an under-TV audio system that also has a set of analog stereo and digital optical inputs. Of course, you also need a screen, or a suitable white wall, on which to project your movies or other video content. Once you have what you need, it is time to connect it all up. Place your video projector on top of the under-TV audio system and place both on a table, moveable low profile rack, or other platform and position the projector/under TV audio system so that it is an optimal distance to your screen or wall. Once you have determined that, the next step is to connect all your source devices to the projector and under-TV audio system. Connect the video output of your source device to your video projector using HDMI (best), component (better), or composite (worst) connections. Next, connect the analog audio outputs from your source device to the under-TV audio system. However, depending on your seating position in relation to the projector and Under TV audio system, you will make the audio connections differently. If the video projector/under TV setup is in front of your seating position (in other words, between your seating position and the screen), make sure that the front of the under-TV audio system is facing back towards your seating position and simply connect either the analog audio or digital optical output of your source device normally. However, if your seating position is in front of the video projector/under-TV audio system (in other words your seating position is between the video projector/under-TV audio system and your screen, or more simply, the video projector/under-TV audio system is behind you), then make sure the front of the Under TV audio system is facing the screen. In order to make sure that the audio soundfield is correct in this setup when you have the front of the under-TV Audio System facing the screen, you also need to make a change in your audio connections between your source device(s) and your under-TV audio system. Here, you must use the analog audio connections and connect the left channel output of your source device to the right channel input of your under-TV audio system and connect the right channel output of your source device to the left channel input of the under TV audio system. Do not use the digital optical audio connection option in this type of setup. You are probably asking yourself what's the deal? Why must I connect the audio in this way? Here is the reason: if you are sitting between the projector/sound system setup (the sound system is behind you), and the sound system is facing the screen, then that means that channels are physically reversed. In other words, the right channel speakers of the under-TV sound system are now facing the left side of the screen and room, and the left channel speakers are now facing the right side of the screen and room. So, in order for the sound to be projected forward to both the listening position and the screen correctly, you must reverse the physical channels using the analog audio connections, which provide a separate connection for each channel. This is also why you cannot use the digital optical connection option in this type of setup as both the left and right channels send through a single cable, and are locked in the digital audio bitstream and cannot be reversed unless your under-TV audio system has an audio or stereo reverse switch which is very unlikely (this used to be a feature on stereo receivers years ago, but is now very rare). Now that you have "freed" your video projector sound setup from the "burden" of a home theater receiver and all speakers, here are some practical uses in addition to a traditional living room setup. One option is to use this setup as part of an outdoor entertainment experience, while other options might include party, classroom, or even business use, where an external audio system is desired, but setting up a full surround sound audio system is not practical. A video projector/under-TV audio system combination is not a substitute for the surround sound experience would get from a dedicated 5.1 or 7.1 channel home theater setup. However, for those with limited space, or would like some portability, a video projector paired with a sound base system might be just the solution, especially when you consider that most video projectors do not provide onboard speakers, and those that do are definitely not suited for watching movies.